If 2 or more cards are in the same column, you can Special Summon this card (from your hand) in that column. You can only Special Summon “Mekk-Knight Indigo Eclipse” once per turn this way. Once per turn (Quick Effect): You can target 1 “Mekk-Knight” monster you control; move that target to another of your Main Monster Zones. Mekk-Knight Indigo Eclipse is like a quarterback, moving his teammates around to create openings. Good ATK and support, Indigo is the monster that can set up an early game swarm. Hard once per turn effect allowing you to move a Mekk-Knight of yours to a different Main Monster Zone of yours. That may not sound as good as other Mekk-Knight monster effects, but when you can do a double Special Summon off the same column, it can make a huge difference. Drop Indigo, move a Mekk-Knight to a zone that isn’t able to meet the requirements for the Special Summons, then drop another Mekk-Knight. Meet the requirements first turn, drop Indigo, move itself, then drop another Mekk-Knight (Blue Sky preferably). With the Extra Monster Zone aligned with columns, you shouldn’t have any issues dropping your Mekk-Knights on the field if your opponent goes for a Link Summon early (often happens), but you can also move a Mekk-Knight Extra Zone monster to a Main Monster Zone and Extra Zone summon another one. Mekk-Knight Indigo Eclipse is a Level 8 Light Psychic-type monster with 2400 Atk and 2400 Def. That’s terrible attack for a Level 8, but the Trade-In potential is good. It has the usual Mekk-Knight once per turn Special Summon column clause that makes them really good at going second. The unique once per turn Quick Effect on Indigo Eclipse is to target a Mekk-Knight and move it to a different Main Monster Zone. This is great for utilizing the Spells and Traps of the archetype by surprise during your opponent’s turn. During your turn, you can move a Mekk-Knight out of the way to Special Summon another one to the same column. Swarming potential and huge offense make me wish Indigo Eclipse had higher attack, but nothing is perfect. Run 3 with Purple Nightfall and Trade-In just for an easy Special Summon engine. 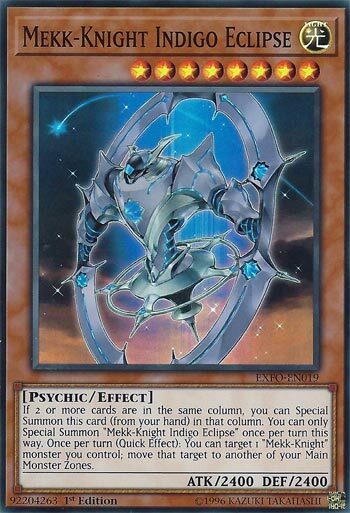 The last Mekk-Knight monster we will look at this week is Indigo Eclipse. Indigo Eclipse is a Level 8 LIGHT Psychic with 2400 ATK and DEF. Stats are fine for a Level 8, which again is a Trade-In target. Indigo Eclipse has the Mekk-Knight clause and his effect isn’t a hard once per turn and is during either players turn. Indigo Eclipse simply lets you move a Mekk-Knight you control to another unoccupied Main Monster Zone. All this does really is clear up the column so you can summon more Mekk-Knights, which is what you should want to do in the deck. Indigo Eclipse is simple, yet staple for the deck. Ratios can depend, but play three if you play the World Legacy cards the Mekk-Knights have. Art: 4.25/5 Probably the second best looking Mekk-Knight. Indigo Eclipse (these cards have some really sweet names, to go with the equally awesome artwork). Level 8, Light, Psychic, this time with 2400 attack and defense. Not at all bad, but leaving a bit to be desired for a Level 8. I’ll take the moment to skip the Special Summon column clause, which you should be familiar with by now. This card has a Quick effect, where it grants you the ability to Target a Mekk-Knight you control and move it to another (main) Monster zone. (Also, these effects, from Special Summon to Quick, remain once per turn). Anyway, at a glance, that may not seem to be anything special. But it can lead to more of your Knights coming out, as you’ll move from a Monster zone you all ready succeeded in bringing out a Mekk-Knight to do so again. It’s a quiet necessity in the Deck.